Is YOUR Application Process Driving Away Top Talent?! 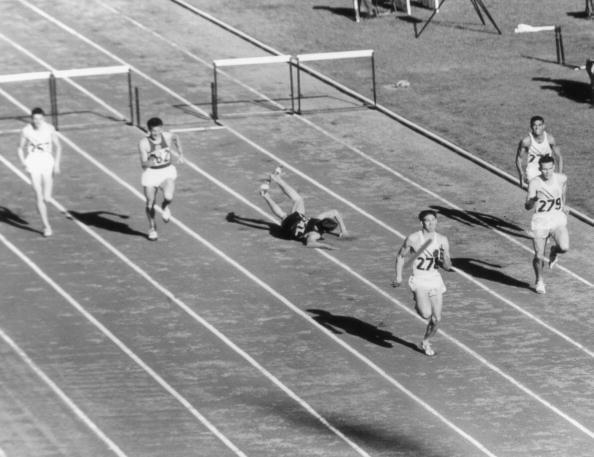 Is YOUR Application Process Driving Away Top Talent at the Final Hurdle? If you clicked through to read this post, you must have had a little niggling doubt in your mind that the answer to the title of this blog, in the case of your company, is ‘yes’. Maybe it’s because you thought your job ad was killer but you’re not getting the hoards of candidates you thought you be by now. Or maybe it’s because you’ve never received the amount of applications you thought you would have done for several jobs over the years. Either way, you have your suspicions that your company’s application process isn’t all it’s cracked to be, and you want to know where you’re going wrong and how can you fix it. The first thing you need to know (if you did’t already) is that today’s job market is a candidate driven one and the quality of their application experience can and will influence their perception of the company they’re dealing with. As a result, establishing a positive relationship with all potential candidates through a courteous, easy application process is essential to improving your reputation with job seekers and filling your talent pipeline with willing candidates for future hiring. In order to establish such a relationship, companies must see the application process as a two-sided affair. We said before, that today’s job market is a candidate driven one and by that we mean that candidates are now just as capable of rejecting you, as you are of rejecting them. So if you entice them to apply with a fabulously creative job ad, but fail to persuade them to complete an application with a compelling application process, you may lose your talent to someone else. Simple as. In the past, the application process has always favoured recruiters and employers. We’ve always expected that if a candidate wants a job badly enough, they’ll take time out of their schedule to put together an application and fill out our forms regardless of how long that might take them. We’ve also always assumed that we need not contact everyone who has applied, just the people we believe are a good fit for the job in the end. Not any more! Candidates are starting to develop negative opinions about companies with bad application processes. Nowadays, if the application process takes too long or a candidate doesn’t hear back from a company after spending a long period of time filling out an application form, candidates start to feel like it was a mistake to waste their time applying to that company in the first place, when they could have applied elsewhere. Such bad feeling can lead to poor company ratings and bad publicity, none of which you want if you’re trying to attract top quality talent. Forming strong connections with interested candidates requires you to understand their side of the equation. For example, filling out lengthy application forms just might not be possible for someone who is already employed and therefore has considerable restraints placed on their time. So you should be mindful of that fact when creating your application process. Similarly, candidates hate being left in the dark when it comes to the application process. If they have spent the time filling out a form, perfecting it and sending it to you, they expect an acknowledgement of their effort for doing so. They need to know that you received that application and they need to know if they were successful with it, as a bare minimum. 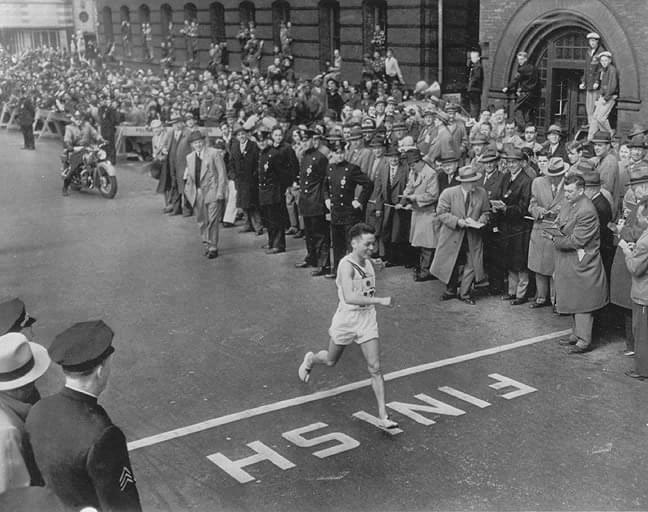 How Can You Improve your Application Process? 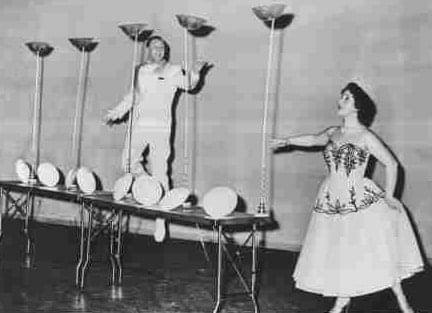 As the National Recruitment Partnership of Australia very eloquently put it, “the job application process is not a circus of spinning plates and flaming hoops for the candidate to balance and jump through, just to prove they want to work for your company. It should be a strategic and nuanced process respectful at every juncture that easily and skilfully determines which candidate shows the most appropriate skill set and best cultural fit“. So while you may think that numerous aptitude tests and questionnaires will facilitate you in finding the best applicant, the chances are the highly skilled candidates you seek will have numerous opportunities waiting for them and they neither have the time or the patience to negotiate your obstacle course of an application process. First and foremost, as a bare minimum, your application process should recognise the people that go through it. Candidates do not look kindly on being left in the dark when it comes to the hiring process. In fact, it’s one of the top 3 frustrations they suffer when going through an application process. Therefore, feedback is an essential element of not only a great application experience, but also a great candidate experience. Honesty, transparency and clarity are what many recruiters feel candidate’s who are not hired, deserve to hear from the recruiter who has chosen not to proceed with them as a candidate. And yes, if a candidate took the time to apply for your job in the first place, you should take the time to put together a proper response for why they didn’t get the job. Feedback builds better candidate’s for the future and will make the candidate respect your decision, because as Stacy Zapar Donovan said Today’s no candidate is tomorrow’s yes candidate (or source of referral) so never burn a bridge. Installing a one-click apply button on your careers site could be the best thing you ever do. One-click apply is a feature that allows candidates to apply for jobs quickly, using a stored CV and cover letter or in some instances an online profile, such as LinkedIn. Having the ability to apply for a job in one click means minimal effort on the candidate’s part and it could increase the number of applications you receive. Take ZipRecruiter for example. They split tested adding both LinkedIn and Indeed one-click apply buttons to their job ads in addition to their own one-click apply button and found significant statistical evidence to prove that adding the two buttons increased their overall volume of applications by 5%. That was against a run rate of 200,000+ applications, so that 5% lift equated to an additional 10,000 applications per month. And to put that into perspective, ZipRecruiter made the point that if they were to try and buy enough traffic to generate 10,000 incremental applications, it would cost them between $20,000-30,000! The raw volume of applications through the Indeed Apply button shot up 75%! Then in June, the raw volume of applications through the Indeed Apply button went up again by another 66% over May. In just 4 months the Indeed Apply button utilisation had increased by over 200% ‚¬€ from 12,000 applications to nearly 40,000 applications in a single month. What’s more, the bulk of these applications appeared to be incremental i.e. more candidates out of the same volume of traffic. You can’t argue with those figures! 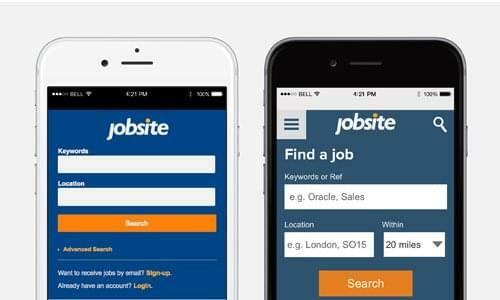 60% of job seekers are now using their mobiles to search for jobs and almost half of them are applying for the jobs they find via their mobiles on their mobiles too. 40% of candidates will abandon a non-mobile application process. 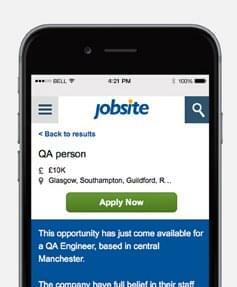 But employers who accept mobile applications are twice as likely to receive as many quality applicants. So having a mobile optimised application process is a no-brainer. As a general rule, applying by mobile should take no longer than 90 seconds. One-click apply buttons (as we’ve seen) are preferable, but if you require a candidate to enter some details when applying it is advisable to have no more than 7 mandatory fields. Take a look at the Jobvite example below. On the left is their old mobile site and on the right, their new mobile offering. The right hand side is much more user friendly as the user can clearly see what fields need to be filled out. Take a look also at their one-click application process below. It’s clean, it’s simple and most importantly, it’s easy to use. Remember, candidates will be using their index finger to scroll through the site and click on any links, not their mouse. Therefore, buttons need to be big enough and text cannot be too lengthy. The Resumator is a web-based app that helps you deal with the demands of the human resource department and managers wanting to recruit new employees. It’s used by some pretty big names in the world of technology, including Pinterest, Hootsuite, Mashable and Atari, and it’s a pretty powerful piece of kit! The Resumator helps you keep on top of your entire recruitment process by giving you the ability to manage applicants, recruit via social networks (for example by running a Twitter or Facebook recruiting campaign) and collaborate with your entire team. For a comprehensive explanation and demonstration of what this amazing platform can do for your company’s hiring process, click here, but we’d like to draw your attention to one feature in particular – their fully customisable online application forms. 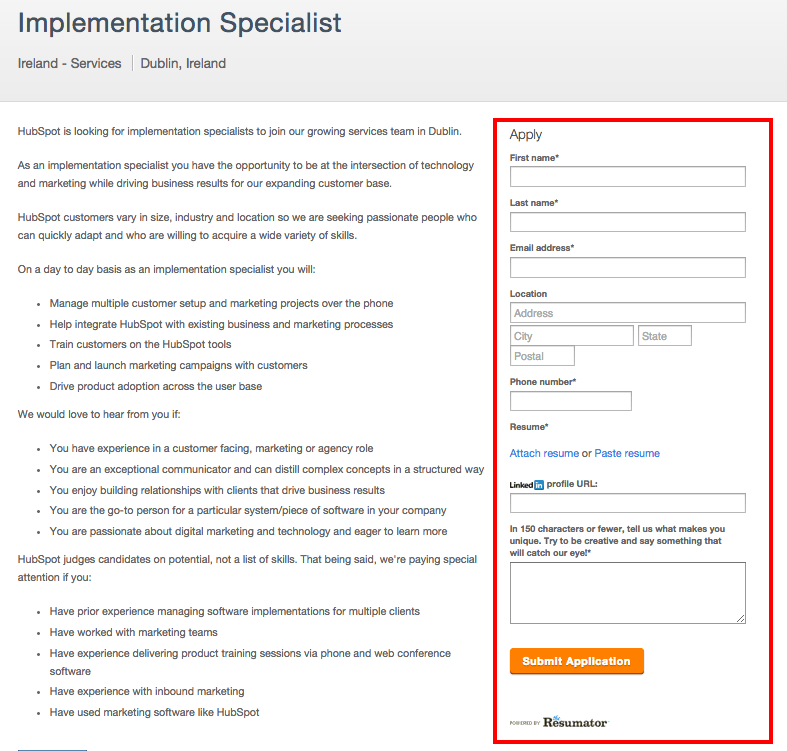 As you can see from the screenshot above, when looking for an Implementation Specialist in Dublin, Hubspot have employed The Resumator’s technology to help them do so in the form of an ingeniously placed and well thought out application form. Unlike most online application forms that tend to appear at the end of a job ad, the one created by The Resumator sits alongside the ad on the right hand side. It’s limited to 7 fields (which is the recommended optimum number of fields for online application forms, only 5 of which are mandatory) and the candidate has the option to submit their LinkedIn URL as part of the process. It’s simple, it’s quick to fill out (even the open text field asking candidates to say why they think they’d be good for the job only requires 150 characters) and the candidate can apply directly from within the job ad itself, which means you don’t loose any potential candidates to a rabbit warren of application webpages. The most important thing to remember when setting out or amending your application process, is that it is a two-sided process. And in order to establish a positive relationship with all potential candidates you need to have a courteous, easy application process in place. Companies that don’t, risk leaving themselves open to poor company ratings and bad publicity at the hands of disgruntled former applicants. The purpose of your application process is to encourage those skilled candidates who have sought out your job opening, to complete an application. It shouldn’t require them to jump through hoops in order to do so. Remember that. Social Talent are looking for a new Intern! It seems that every week or so a new Recruiting tool is coming on stream. There's a gaping hole in the market for a one-size-fits-all, does-everything type recruiting solution, but realistically one size fits no one. During the last week we learned of JobVidi which is a new job-board meets CV-database meets social-network tool. 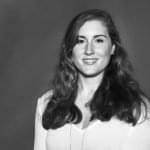 It's the brainchild of founder James Brookner, and has attracted quite a lot of attention since going to live to recruiters in the last few weeks. His essential premise was to take the best of social networks and try and fix the problems with current job boards, meld the two and see what happens. So far so good! Less and less developers and IT professionals are putting themselves up on spaces like LinkedIn for fear of the deluge of recruiters who'll annoy them with unsolicited invites and job queries, so it's no longer a great area to fish anymore. In fact, several IT recruiters have told us that they're noticing their connections disappearing off LinkedIn or deleting experience from their profiles so that they don't come up in searches by Recruiters. As Glen Cathey wrote a few weeks back, Recruiters are ruining LinkedIn.